Congresswoman Tammy Duckworth is running to represent Illinois in the U.S. Senate. 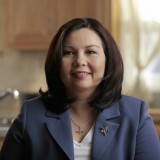 Learn more at www.tammyduckworth.com. This election has been challenging for all of us, but it’s also served as a testament to our strength and our resilience.